Great built-in display to help you understand the loop progression and plenty of recording power for small performances. Boss, being one of the most dominant names in the guitar pedal industry, is one of the best brands to turn if you’re ever looking for any kind of guitar pedal. We’re looking at the RC 1 loop station, and in simple words – it’s one of the finest you’ll find in the price range. It’s neither cheap or expensive, but it brings plenty of benefits to the table, most notable being versatility, exceptional reliability, and absolutely stunning audio performance. 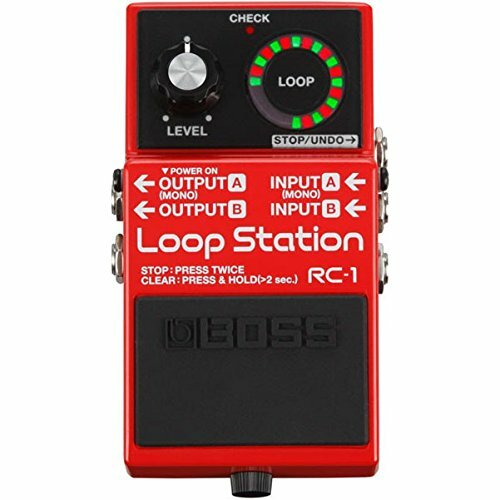 The RC 1 Loop station is superior to most similar looper pedals in terms of the user friendly design, excellent loop time, and, one of the factors that most beginner guitar players tend to overlook – connectivity. Be sure to check out the other pedals that made our looper pedal buying guide. Boss’ RC 1 loop station packs 12-minute recording time, a single ‘level’ knob, ‘check’ and ‘loop’ indicators, and various ins and outs. Though being supplied with such a modest set of features isn’t like Boss at all, the straightforward method of operation is actually pretty beneficial in this case. The external footswitch controls are very flexible, and it’s very easy to use it in general. Of course, an immediate beginner might find it a bit hard to figure out the connectivity, as there are dual mono and stereo outputs and inputs. The RC 1 loop station is by all means a simple loop pedal with a straightforward method of operation. There’s just one knob – the ‘level’ knob. Right next to it you’ll see the loop ‘station’ and atop it the ‘check’ indicator. The ‘clear’ function is actually integrated in the footswitch, you just need to press it and hold it for approximately two seconds. This loop pedal performs great in many respects. First of all, the 12 minutes recording time is superior to the average of 8-10 (although the difference isn’t all that big). On top of that, the batteries on which the RC 1 loop station operates on can survive some 4,5 hours on a single run. If that seems too little, you can use an AC adaptor, although it is sold separately. Sonically, there are maybe only a few loop pedal models that could compete with RC 1 loop station. It provides a great audio quality, one that’s not all that common in that specific price point category, but most people would only expect as much from Boss. It’s designed in the same fashion as virtually every other Boss pedal, and durability wise it’s remarkably sturdy. Lastly, like we’ve mentioned already, superb connectivity is definitely one of the things that make the RC 1 Loop station so valuable for the money. There’s just one thing you need to be very careful about. Namely, if you want to procure a loop and not put another layer on top of it, you need to double-step the footswitch. This might require some getting used to, and while it does seem convenient to some people, other treat it as a major flaw.